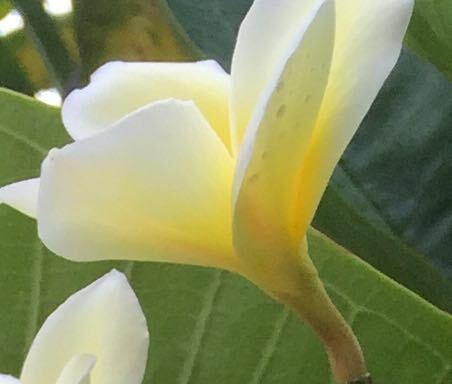 Plumerias are beautiful trees filled with clusters of flowers. So it was a bit odd that I was drawn to crop out the many and focus on just one. But, ONE has value. One flower. One person. One prayer. It is the TENSION between those two in which You call us to live. I also live in the tension of caring for myself and caring for others. That sounds easy. But, I am learning that caring for myself depends on seeing myself as needing care. I want to stay in my childhood “invincibility” mode. Helping others . . . and thinking I can keep on going and going. I can’t. How foolish and adolescent of me to imagine I am “superwoman”. I need to rest and to recharge. I need to listen to myself and to affirm my own existence . . . lest I grow grumpy and irritable. Self care is so basic and necessary — yet a part of me still sees it as Selfish.